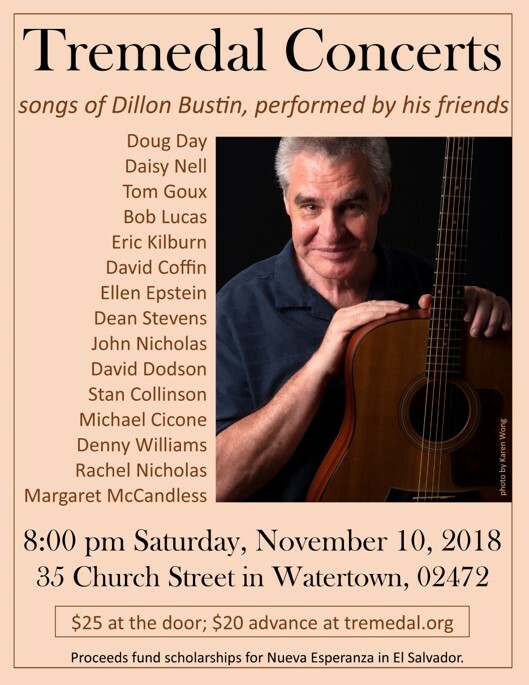 The latest Tremedal Concert will feature The Songs of Dillon Bustin: As Performed by His Friends. Dillon Bustin is a songwriter, a playwright and a retired arts administrator. This concert, which brings together a host of his friends, folks who have recorded his songs over the years, is also a grateful tribute to the best kept secret in New England Folkdom. The sheer volume of Dillon’s prolific output, all produced in the background of long a successful career as an arts administrator with various organizations in the Boston area, most recently, a 10 year run with the Hibernian Hall in Roxbury. We are sort of bidding Dillon a bit of a farewell, as he and Martha have moved to Rockland, Maine … still, we hope there will be frequent sitings!! Invited singers (mostly confirmed) guests include: David Coffin, Michael Cicone, John and Rachel Nicholas, David Dodson, Dean Stevens, Daisy Nell and Stan Collinson, Bob Lucas, Tom Goux, Margaret McCandless, Denny Williams, Ellen Epstein … the list grows. Tickets cost $20 before performance day and $25 at the door. Get tickets online by clicking here. The Tremedal Concerts benefit the Watertown-El Salvador Sister City Project. Proceeds after expenses support the sister community of Nueva Esperanza, El Salvador, and regional projects in Chalatenango Province.